This is a playground for climbers. Moana Park is just behind the Moana Surf Lifesaving Club, with a view of the beach. 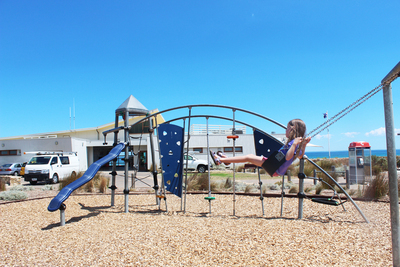 It used to be home to a traditional style playground, but after a refurb a few years ago, the park now has a new playground unlike any other in Adelaide. Ultimately it's a park for climbers. Slides, stairs, and walking bridges are done away with. Instead there are climbing walls, ladders, ropes, and other obstacles that require kids to use their brains while they climb. It's a strength and a weakness at the same time. Unfortunately the park feels a bit limiting for younger children who are either too young to climb, or who are a bit scared of anything too tricky. There's no smaller playground for toddlers and babies, and some kids will need mum and dad there every step of the way, helping them across all the obstacles. Thankfully the swings are still there, and there are a few bouncers. There's a large patch of green where kids can drop all their excess sand with a run around after the beach. 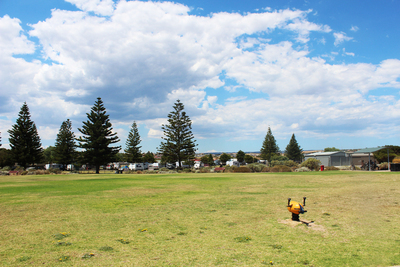 It's clear and tree free, so it would be good for playing footy, or cricket, or even flying a kite when the wind is up. 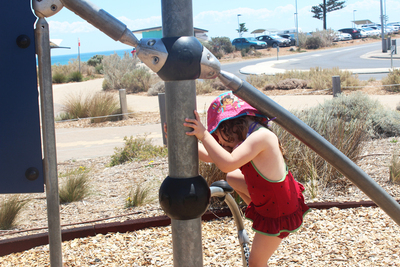 I didn't think the 4-year-old would find it as fun as her older sister, but while I turned my head she had made it from one side to the other, climbing the whole way. 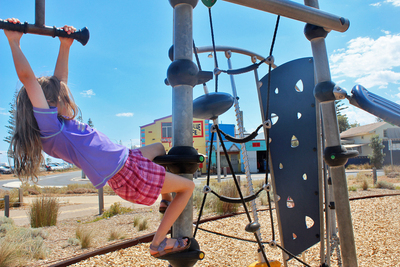 So don't discount the playground just because you can't figure out how it works. 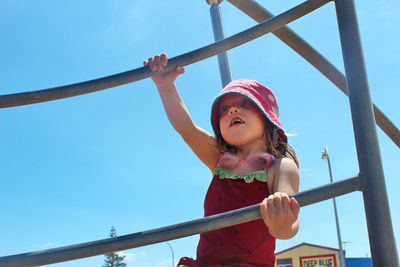 The Moana Park Playground probably won't suit all kids, but if you've got a little monkey on your hands who needs to let go of some of their climbing energy, bring them along and just let them climb. The park is also just across the way from the Deep Blue Cafe, stocked up with drinks and ice blocks for those extra hot days.